Picture is representative of final product and some variation in color and patterning may occur. Upon receiving your order we will send you a postage paid ash collection kit, and your order will be shipped within 2 weeks of receiving the ashes. Pendant Size: approximately 1" x 1"
The Classic glass cremation pendant is exquisitely crafted by the hands of a caring and skilled artist. Each glass pendant is hand crafted using dichroic glass, a material chosen for its ability to reflect a dazzling array of colors. Your custom hand made pendant includes a small portion of your loved one’s cremated ashes encased within the back side of the glass pendant. By your request, the ashes can either be visible to the eye (only from the back) or hidden within the glass cremation pendant. 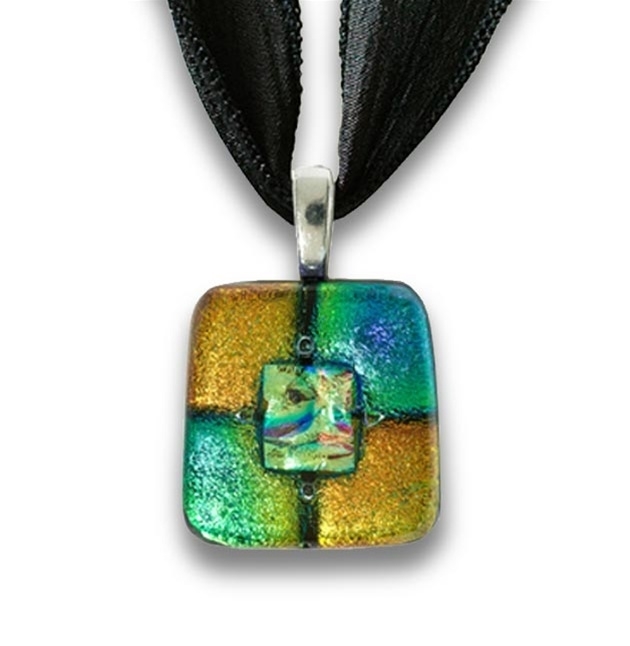 This particular glass pendant model measures approximately 1” squared and features 2 sterling silver bails securely mounted to the top for the black silk ribbon which is standard. For an additional cost you can also choose from a 16”, 18” or 20” sterling silver ball chain.